Former chief operating officer for the city of Chattanooga Brent Goldberg is shown in this 2014 staff file photo. Former chief operating officer for the city of Chattanooga Brent Goldberg is joining Hamilton County Schools' finance department. Goldberg resigned from his city post in 2015 to become vice president and chief financial officer of Lesco Logistics and Lync America. He will replace school district veteran Christie Jordan as chief financial officer for the district when she retires in June 2019 and will work alongside her in the interim. Hamilton County Schools finance director Christie Jordan speaks to members of the Hamilton County Board of Education as they meet to rework their 2016 budget request Monday, June 1, 2015, in Chattanooga, Tenn.
"I am honored to have the privilege to serve the children and families of Hamilton County Schools," Goldberg said in a statement. "Nothing in our community is more important than education, and I am excited to join a fantastic team working to make Hamilton County Schools the fastest improving school district in Tennessee." Goldberg's starting salary, $126,816, is the same salary with which Jordan will retire. In the spring, as the school district moves into the 2020 budget cycle, Jordan will work alongside Goldberg "to develop the budget and ensure a smooth transition of financial responsibilities," according to a press release. "It will be an invaluable experience to work alongside Christie Jordan," Goldberg said in a statement. "Christie's dedication to Hamilton County Schools is unparalleled, and we are very fortunate to have the ability to complete a deliberate and strategic transition over the coming weeks and months." Superintendent Bryan Johnson noted his desire to bring a local perspective to the position. 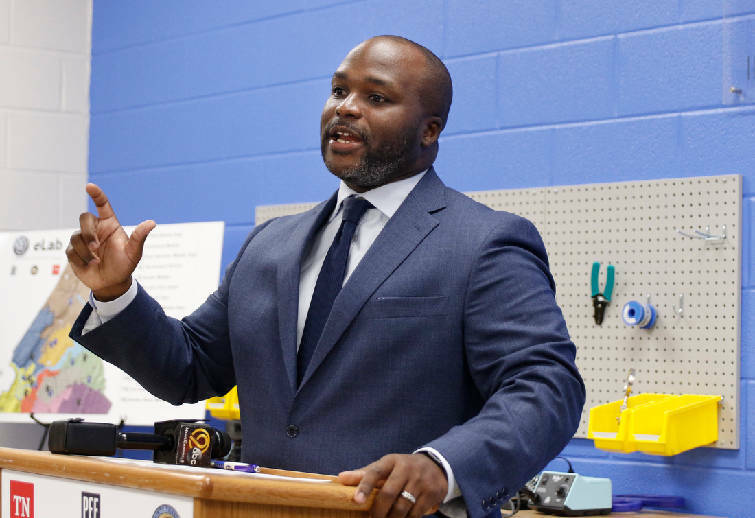 Schools superintendent Bryan Johnson speaks at a ribbon-cutting ceremony for 8 new Volkswagen eLabs at Hixson Middle School on Tuesday, Aug. 21, 2018, in Chattanooga, Tenn. The 8 new labs complete a total of 16 technology-centered labs in schools across Hamilton County. "Decisions in the district over the past year have sought to address many recommendations for improvement made in May 2017 by the budget working group, which was comprised of business and community leaders," Johnson said in a statement. "In the area of finance, the recommendations focused on developing budgets based on district priorities, multi-year budgeting for outcomes, and prioritizing resources to meet the needs of children by matching outcomes with investment. Brent Goldberg brings a local perspective and a wealth of financial knowledge to the district that will help us continue our progress toward those goals." Jordan noted her approval that the district had chosen a local hire to replace her. "Having someone local taking the reins of the business operations of the school system will be very beneficial for Hamilton County Schools," she said in a statement. Jordan, who worked for Chattanooga Public Schools and then the county district after the merger for a total of 29 years, announced her plan to retire at the end of the 2017-18 school year, but stayed on as the search was conducted for her replacement and will now officially retire at the end of the 2018-19 school year, according to a press release. It is unclear if the retirement incentives offered to retirees last school year played into her original decision or if Jordan will be eligible for the bonuses. Goldberg is a certified public accountant and a certified transportation broker. He earned a bachelor's and master's degree in accounting at the University of Tennessee at Chattanooga, where he has also worked as an adjunct instructor. Along with his experience with the city, Goldberg has also previously served as director of finance and operations for the Public Education Foundation (PEF) in Chattanooga, director of the Chattanooga Fire and Police Pension Fund board, and as a senior auditor and business consultant with Hazlett, Lewis and Beiter, PLLC in Chattanooga, Kraft CPAs in Nashville, and Reznick Group in Bethesda, Maryland.